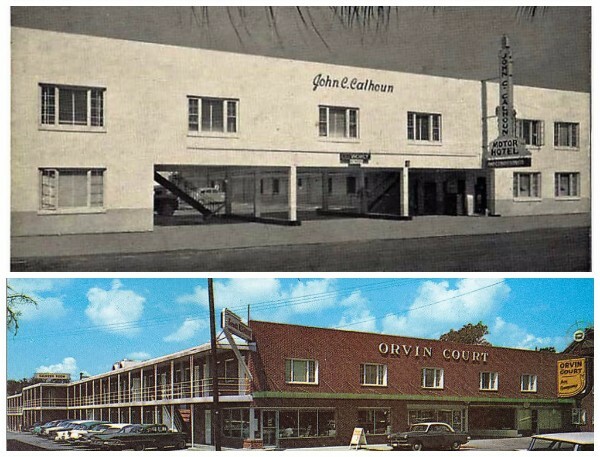 Downtown Charleston's first motor hotel, the John C. Calhoun opened in 1950 and was later remodeled and renamed Orvin Court. The term motel (from motor hotel) was coined in 1925 with the opening of the Milestone Mo-Tel in California; while motels became increasingly popular in the '30s and '40s, the concept really didn't take off until after WWII. The automobile was responsible for this unique type of accommodation, as travellers no longer had to depend on trains and the requisite downtown hotels that trains delivered them to. Before cheap motels came along, travellers set up camp right next to their cars in auto camps. Soon landowners built cabins to shelter car tourists near roadways for extra income, and when the facilities began to offer security and shelter for the automobiles as well, the form for the modern motel developed. Motel building boomed in the '50s and '60s and establishments began to offer travellers the adventures they were seeking right at the site. Tourists could engage in recreation at the motel site, keep their cars outside the door, secure their belongings in their room, employ a chain lock to keep out intruders and voila: adventure and security in one package deal. Another American dream was born. The first motor hotel opened in downtown Charleston at the corner of Calhoun and Coming Streets in November, 1950. More than a thousand people came to the grand opening to take a tour. The "thirty-two rooms and suite are decorated with strikingly modern yet warmly gracious motifs. Each room is air conditioned--automatically heated or cooled by thermostatic controls according to the season. Running ice water in every room is another feature of the John C. Calhoun." The Motor Hotel had a dining room on the second floor--the Calhoun Room--with an "unusual 'wall of glass' window arrangement." In subsequent years the motel was redesigned, reducing the entrance and a coffee shop was added when it was renamed Orvin Court. The College of Charleston acquired the motel and used it as a dormitory in the 1970s. The site was used for parking for a number of years after the buildings were raised, and do y'all know what's there now? Well, about six years ago, the College opened its $58 million New Sciences and Mathematics Building on the site, which also houses its Natural History Museum. Have y'all been to see it yet? 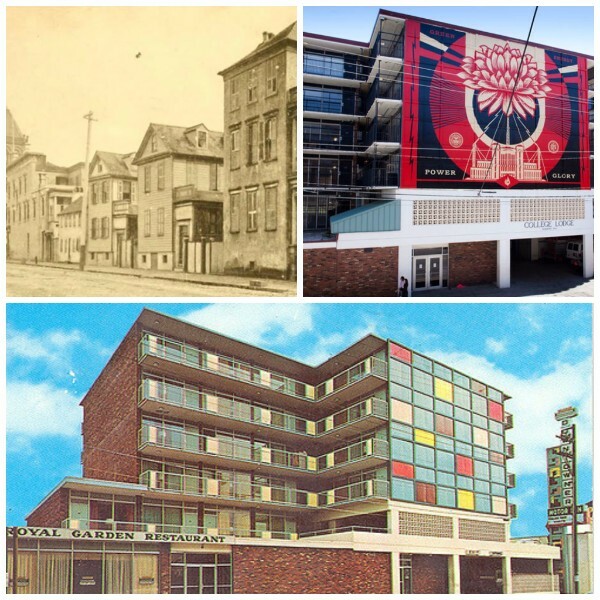 The Downtowner Motor Inn was constructed in 1963 (bottom) and is now used as as a dormitory at the College of Charleston, College Lodge (shown upper right with the art installation by Shepard Fairey on the Calhoun Street facade). Upper left: the location of this site in 1892. Three new motels were under construction in 1963, opening within months of each other in the beginning of 1964. Mayor Gailliard was present for the ribbon cutting ceremony for the Downtowner Motor Inn at 157 Calhoun Street in January, 1964. The building was very different than anything downtown Charleston had seen before. At six stories tall, it had 100 guest rooms with free guest parking on the first and second floors, a heated swimming pool, the Royal Garden Restaurant, and the Royal Cellar Lounge that enticed guests to "relax in an atmosphere of refinement and good taste," with entertainment nightly. By the early '70s, the Lounge was advertising for "discotheque dancers and attractive young ladies to dance the go-go" in Charleston's finest discotheque, the Swingin Cellar. Nice, right? The motel was sold in 1972 and operated as a Golden Eagle Motor Inn until the College acquired the property in 1975 and converted it for use as another dormitory. After several near-demolitions, the College Lodge remains a coveted dorm assignment today and is currently sporting an art installation by Charleston native Shepard Fairey on the Calhoun facade (above, right) that was created as part of Spoleto a couple of years ago. Some might find the mid-century modern architecture odd on the Charleston streetscape, but we love it. The structure is thought to be one of very few iconic Downtowners left, as most of the motels built by the developers from Memphis have been razed. Lucky us! The Charleston Inn on Lockwood Blvd opened in 1964 and served Charleston's motor tourists for more than 30 years. Along with the Downtowner, the King Charles Motor Inn was constructed in 1963. This is the motel that was built on the site of the Argyle Hotel at the corner of Meeting and Hasell Streets, which we discussed last week. After many transformations, the King Charles is still in operation. Another motel that was under construction in 1963 and opened the following spring was the 130 unit operation built on 6 acres facing the Ashley River behind a 820 ft concrete bulkhead. Talk about recreation on site? At the Charleston Inn at the foot of the Ashley River Bridge there was a putting green, Olympic-sized swimming pool, and semi-tropical landscaping. Just a few months after opening, the motel made the news in reports of a shootout, where the proprietor described the guest room as riddled with bullets and bulletholes. Eleven shots were fired in August 1964 when a husband busted into a room where his wife was with another man. One man was taken to the hospital and the wife later said that it was all just "a big misunderstanding," which totally makes sense. Otherwise, the motel enjoyed great success through the '60s and '70s. The motel industry toppled by the 1980s as the interstate system grew and popular chains like Holiday Inn began moving the trend of accommodation back to the old hotel form. The Charleston Inn was no exception and finally damages from Hurricane Hugo sealed the fate of this once popular motel. It was razed in the mid-1990s and a new Courtyard by Marriott rose in its place. To be truthful, it had become a hazard (parts of the motel and the parking were, um, sinking) and an eyesore (half the roof was gone and it had been unoccupied for some time) but still, it would have been nice if this one had been saved. After all, every city has several Marriott's so there's nothing singular about that, is there? The Golden Eagle Motor Inn (now Days Inn) at 155 Meeting Street has been in operation since 1968. 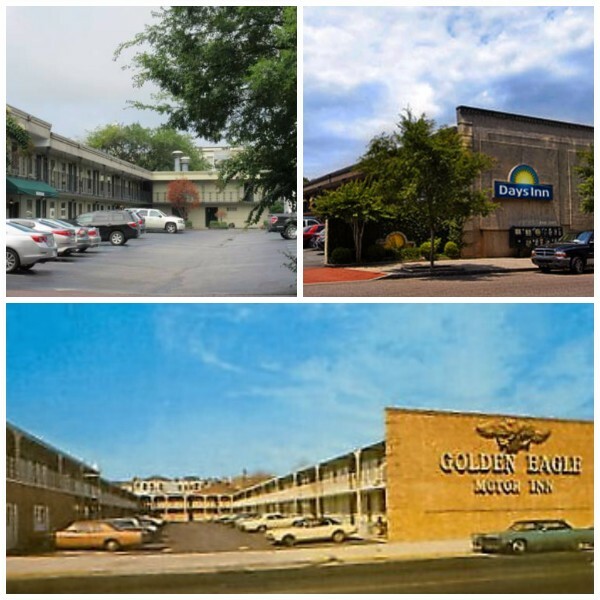 The Golden Eagle Motor Inn at 155 Meeting Street was built by a Charlotte firm in 1968. The 121 unit motel was constructed using the same design that was seen across the southeast. Per company rules, there was a restaurant but no lounge or liquor service. The requirements of the motoring tourists that came to Charleston, however, had the company rewrite the rules for this location. In 1975 the locally owned and operated White Horse Inn Restaurant and Lounge opened on site and became a very popular happy hour spot for locals. In 1983, Days Inn purchased the motel, making this the third Days Inn in the Charleston area. With some changes to the facade and updated rooms, the motel still operates as a Days Inn today. So if you have some guests coming downtown who really want air conditioning, color TV, a pool, and their car parked right outside their room, this is probably their best bet but be forewarned: the Magic Fingers Vibrating Beds have all been replaced. The Brooks Motel on Morris Street served as a sort of headquarters during the Civil Rights era. The Morris Street Business District in Cannonborough/Elliotborough is an important historic area where numerous Black-owned businesses thrived for many years. Benjamin and Albert Brooks owned and operated the Brooks Motel and Restaurant as well as the Brooks Grill and Brooks Real Estate Company, all clustered around the intersection of Morris and Felix Streets. In addition to the St. James Hotel on Spring Street (where the McDonald's sits today), the Brooks Motel was the only accommodation available for African Americans visiting Charleston during the era of segregation. 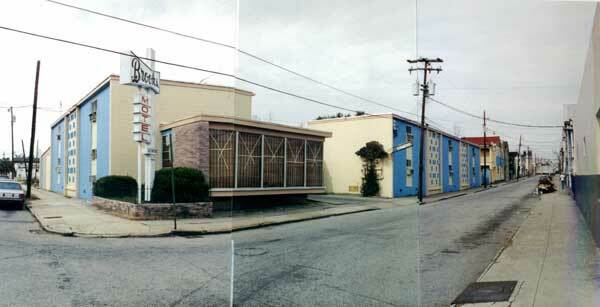 The Brooks Motel served as a local headquarters during the Civil Rights movement in Charleston; Dr. Martin Luther King stayed here in June, 1963. Like many others, the motel fell into poor condition; it was approved for demolition in 1995 and torn down around 2001. The area has since undergone revitalization and numerous new residences have been been built in the area. Lois has been especially active in this bustling part of the city of late. She recently represented the sellers at 2 Felix Street, across the street from the site of the former Brooks Motel. 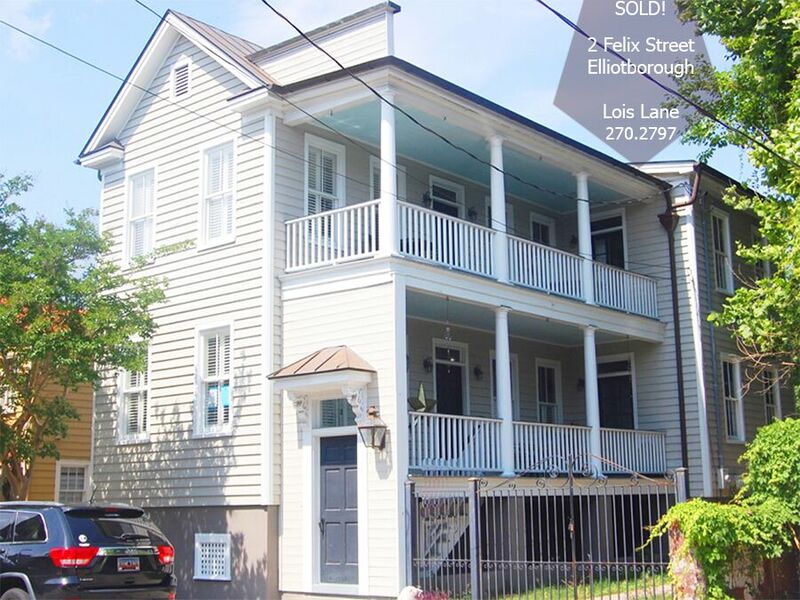 Congratulations to both the buyers and sellers of this charming Charleston single! 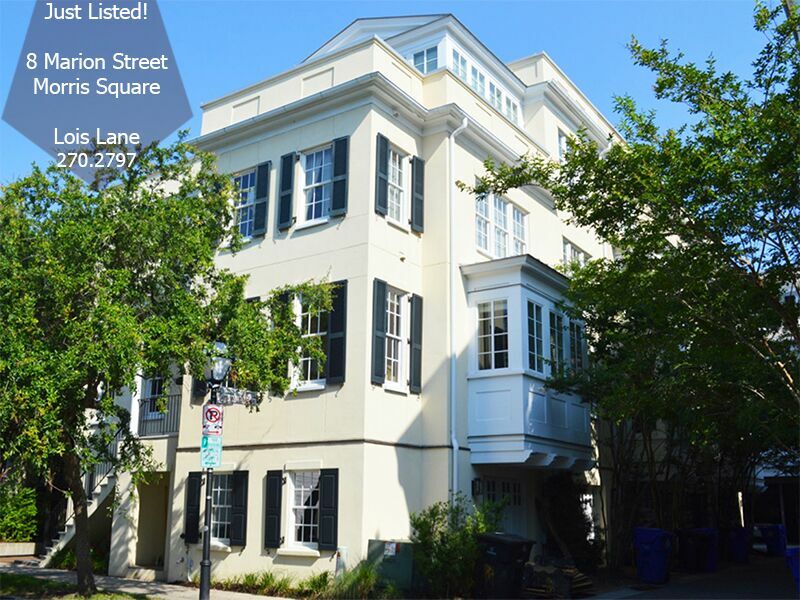 Just last week, Lois listed a townhouse for sale down the street in Morris Square. Give her a call at 843.270.2797 or send her an email to lois@loislaneproperties.com to schedule a showing. You've got to see the view from this rooftop deck!